At the closing of his trade summit visit to China, Barack Obama and Chinese President Xi Jingping announced a landmark agreement between the two largest carbon polluting nations for the US to reduce its emissions by 26 to 28% (versus 2005) by 2025 and for Chinese emissions to peak by 2030 at the latest. China had always focused on reducing its carbon intensity with overall emissions still growing rapidly. This is the first time China agrees to cap overall emissions and reduce them afterwards. 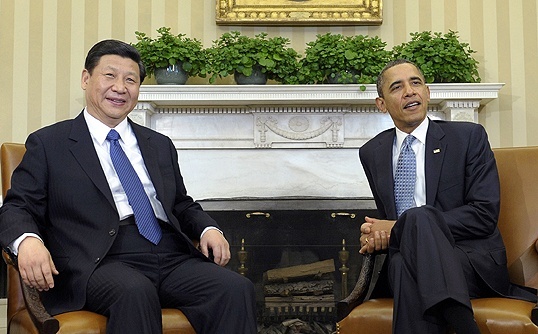 Together, China and the US account for around 45% of global emissions – China for 29% and 16% for the USA . The deal represents another important step towards a global agreement being reached at the climate conference in Paris next December. After a disappointing New York climate summit in September (it had not been attended by the Chinese President and Indian Prime Minister), a positive streak of developments has been unfolding. France announced a new energy law with ambitious targets for emission reductions and renewable energy in late June. In late October, the European Union, the 3rd largest emitter (11% of global carbon pollution), announced its commitment to reduce greenhouse gases by 40% before 2030. And just a few days ago, the IPCC and UN Secretary General, Ban Ki-moon, released a report that refuted the false choice between the economy and environment stating that reducing emissions to zero globally would have a very modest impact on global economic activity while continued climate inaction would result in mounting economic and human costs. For the first time reducing climate emissions was presented as a pre-condition to improve the lives of and hopes of the hundreds of millions of poor and underprivileged that are least responsible for causing the climate crisis and yet disproportionately suffer its consequences. In parallel, the US Environmental Protection Agency also raised the alarm about the impacts on human welfare, wellbeing and the economy of climate disruptions and extreme weather events in the US and worldwide. It is time for a new paradigm for human development and wellbeing. The first step was agreeing to change course. After years of sterile debate, it appears we now moving in the right direction. Incremental change will not do it. A transition is not sufficient, urgent transformational change is required. Technology will have a role but will not save us. The time for a solutions driven economy and society has arrived. More on that soon. This entry was posted in Climate Change, Energy efficiency, energy security, Uncategorized by adamkoniuszewski. Bookmark the permalink.